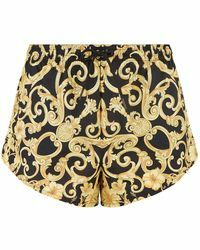 You wouldn't expect anything less than pulse racing pattern from Versace's swim line and its Baroque swim briefs stand tall among the beach competition. Crafted from stretchy, quick dry material, the motif is typical of the brand's iconic 90s period and we're happy to have it back. Mid weight and cut to flaunt as much of your physique as you dare, do them justice by sliding on some Versace sandals and aviator glasses. Versace jersey briefsRegular fit, mid rise, elasticated waistband and drawstring at interior, all over baroque print, tonal stitching, medium weight fabric80% nylon, 20% elastaneMachine washSize large: Waist 30"Model is 6ft and wears a size largeMade in Italy.